7 Convicted In Assassination Of Honduran Environmental Activist Berta Cáceres was killed in western Honduras in 2016 and her murder brought renewed attention to the dangers environmentalists face in Central America. In a telephone interview from Oakland, Calif., Cáceres' nephew, Silvio Carrillo, spoke with NPR. "Just because there was a conviction, doesn't mean the justice system works in Honduras. There are still masterminds out there, and there's no indication that they are going after the masterminds," Carrillo said. Judges convicted two former executives of Desa, the company with the concession to build the dam, including Sergio Rodríguez, Desa's director of environmental and social development, and Douglas Bustillo, the company's security chief. Robert Amsterdam, international counsel to Desa, told NPR the company's executives are innocent of the charges against them. "Simply the court had none of the evidence to convict. In respect to Sergio Rodriguez and the references to Desa, they are all without foundation," Amsterdam said. "Human rights organizations have stampeded the court in Honduras, which is subject to a tremendous amount of political pressure, into rendering a judgment that is flawed." "We consider it a fair step towards justice ... but still we have some concerns. The process had many flaws," Marcia Aguiluz Soto, the director for Central America and Mexico at the Center for Justice and International Law, a human rights group that has worked with Cáceres' family, told NPR. "One of our main concerns is that the masterminds of the assassination are not being judged yet. 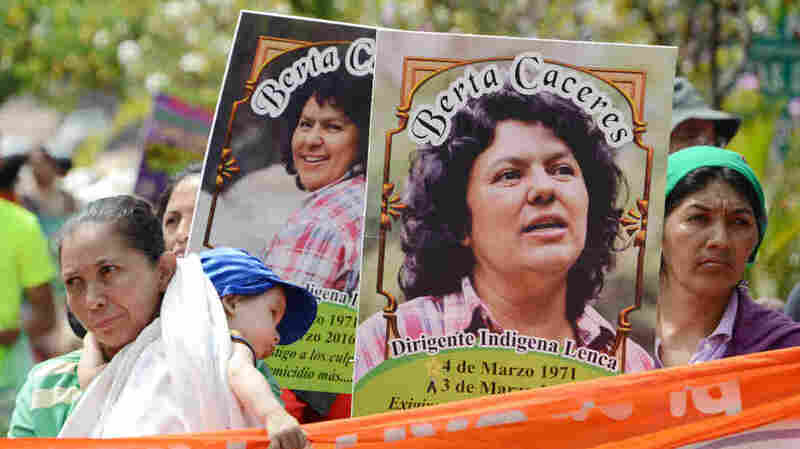 Basically the tribunal that convicted the seven persons say that they know, and they have proof, that stakeholders and managers of the Desa company planned for the assassination of Berta Cáceres, and paid for it." Cáceres, a Lenca woman, had waged a 10-year fight against construction of the dam, which was to be built over water considered sacred by the indigenous Lenca people, who also said the dam would endanger their water resources. She led a campaign which "involved filing legal complaints against the project, organizing community meetings and bringing the case to the Inter-American Human Rights Commission," according to The New York Times. In 2015, Cáceres' won the Goldman Environmental Prize, which is given to grass-roots environmental leaders, and the award gave her work international attention and acclaim. 44-year-old Cáceres was murdered just a year later, when two gunmen broke down the door of the home where she was staying in the town of La Esperanza, which translates to "hope" in Spanish, and shot her six times. Cáceres' nephew, Carrillo, says he was dumbfounded by news of her death. "There is just a constant denigration of my family, of the indigenous people in Honduras, and a lack of respect. This is what Berta was fighting for. They deserve the respect that anyone of us do, whether we're white, brown, black, it doesn't matter. This is the root of the problem in Honduras, where the wealthy control the power structure, and the impoverished don't have a voice," Carrillo said.